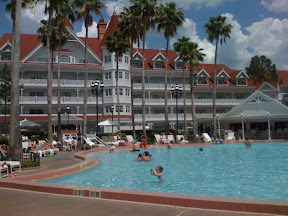 We are nearing the end of our stay at Disney's Grand Floridian. It is honestly the most gorgeous place I have ever been! It is made up of 8 buildings across Bay Lake from The Magic Kingdom. I can see the castle from right in front of our building. I'll be posting more pictures and details when I get home, buy here's a beautiful one I took the otherday looking from the main building toward the pool.